It’s been over a year and a half since Vancouver’s Langara College became the first campus in Western Canada to join the globally popular Meatless Monday movement. The Vancouver Humane Society (VHS) first introduced the initiative in March 2015 to Langara’s Environmental Club and food service provider, Chartwells. Both groups eagerly supported bringing it to the school’s cafeteria after learning about the impact of our society’s overconsumption of meat on animal welfare, the environment and public health. “We felt this was a great opportunity to take a small, but powerful, step by raising awareness of the impact of our food choices and offering options to reduce that impact,” said Rizwan Bandali of Chartwells/Compass Group. 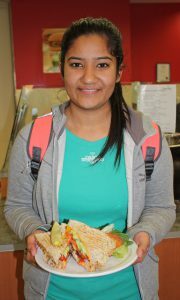 And seize that opportunity is exactly what Chartwells and Langara College did, with the introduction of delicious meatless menu items! 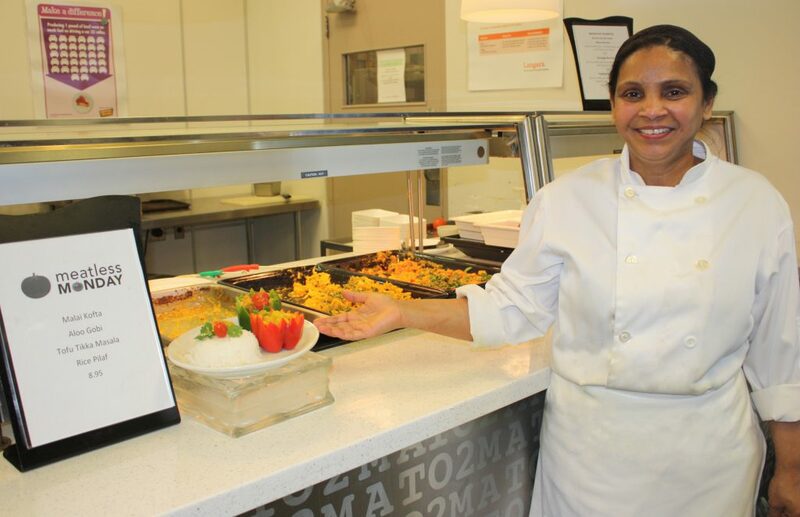 The cafeteria kicks off each week with a wide variety of options, from roasted veggie paninis and mouth-watering curries to meatless meatballs, veg lasagna and creative tofu dishes. Meatless Monday specials have been paired with eye-catching, educational posters aimed at raising awareness and boosting participation in the initiative. Statistics outlining water use and greenhouse gas emissions from meat production are another way the campaign extends education into the cafeteria and inspires individual action. Chartwells reports sales have been steadily increasing and feedback regarding the meatless items has been very positive. So much so that the cafeteria recently began offering an additional daily hot vegetarian bar, adding even more meatless options to the menu. Langara’s campaign has effectively blazed a trail for other Lower Mainland schools interested in taking similar steps to help protect animals, our health, and the planet. To date, the British Columbia Institute of Technology, Eric Hamber Secondary and Winston Churchill Secondary have implemented similar initiatives and others are set to join as well. “We’re thrilled to see Meatless Monday catching on here in the Lower Mainland and we commend Chartwells Langara for helping make that possible. Factory farming, climate change and public health are major issues facing us today. They can seem overwhelming from an individual perspective, but when we realize that we can have a significant impact simply by what we choose to put on our plate, we can take steps to support a kinder, cleaner and healthier world,” said VHS Program Coordinator, Emily Pickett. Follow Chartwells Langara’s lead by taking our online Meatless Monday pledge. We’ll share a weekly recipe to help you keep your commitment! You can also support our effort to bring Meatless Monday to more classrooms, cafeterias and communities by making a donation today. Interested in bringing Meatless Monday to your school, workplace, business or community? Get in touch with Program Coordinator, Emily Pickett, to learn more! I am happy that Chartwells has embraced Meatless Mondays as it helps educate everyone on the alternative to meat, in a way that is delicious and inviting. All movements start with small steps; one day without meat makes a difference and hopefully this will create a culture of folks willing to look at alternatives to meat. It makes me proud to work somewhere where an innovative Chartwells staff continues to promote diversity of selection and even contributes to global issues – I am excited to see the benefits this will have on the Langara community and all around the world. Thank you dedicated Chartwells management and staff!